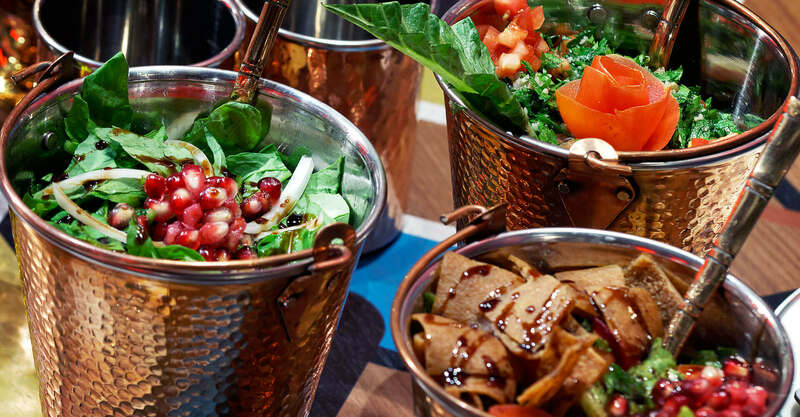 Prepare to be wowed by the vibrant colour palates and sensory experience that is Roman Zaman, a contemporary take on the traditional middle eastern – and specifically Syrian – cultural dining experience. 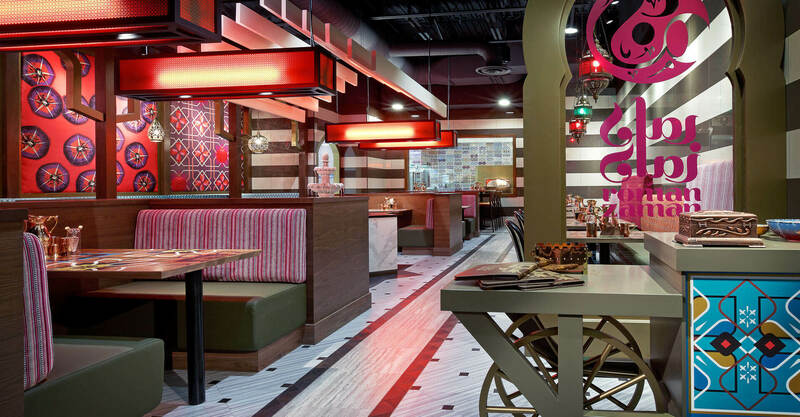 With a vision to bring authentic Syrian cuisine to Mississauga, Roman Zaman approached us to help them design a space that embodied a Syrian dining experience. Roman Zaman translates to “the old Pomegranate”, and the middle eastern fruit can be found represented in various ways throughout the space, from the wallpaper patterns to the colour scheme. 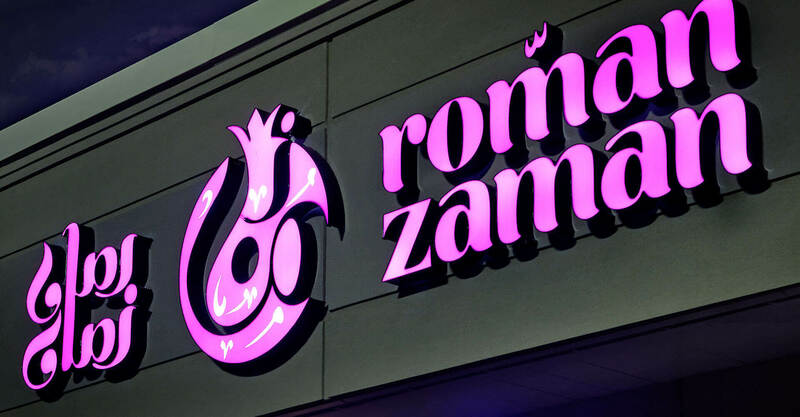 The team at Roman Zaman wanted an interior design program that was inspired and unique, but something that they could use to extend the business to other restaurants and possibly franchises later on. We started with a review of over 1300 reference photos of old Syria and Damascus provided to us by our client. The team from Roman Zaman guided us, helping us to capture the essence of Syrian food and culture. We used old patterns and architectural styles to inform our design, and our client was open to layering patterns and textures on top of each other, with few limits to the diverse array of materials and patterns we selected. 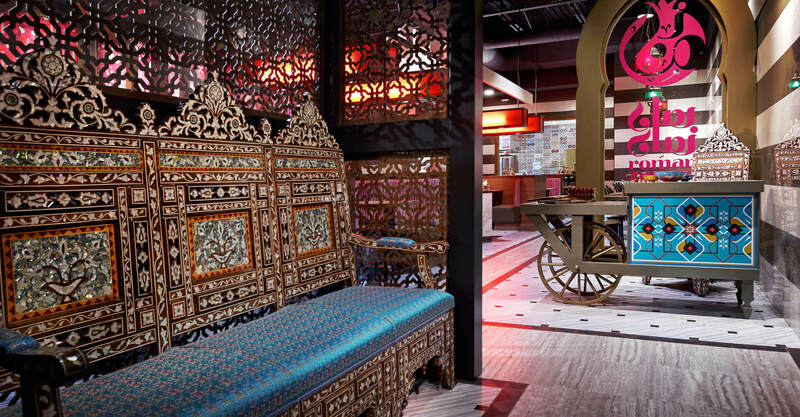 Immediately upon entering the restaurant, guests are treated to a waiting area with a dividing wall featuring laser cut panels with Islamic detailing that were imported from California. The hostess stand is a custom cart – a nod to the Syrian street food vendors in Damascus. The flooring is luxury vinyl, with a look and feel that is almost indistinguishable from cut wood and marble, but value-engineered for durability, practicality and cost. The most striking feature is the custom-made seating bench, imported from Syria, featuring rich fabric and marble inlays. The bench was one of many pieces that the client sourced and asked us to incorporate into our design. Beyond the welcome station the flooring and striped wall invites guests into the space, and pulls the eye towards the pizza and saj area at the back. This exposed area brings the theatre of the kitchen to guests, and is highlighted architecturally by the imported Spanish tile behind the traditional saj oven. 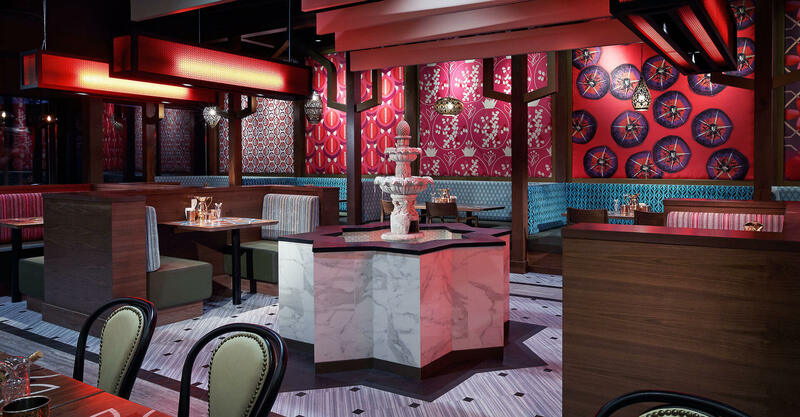 Guests will be captivated by the hanging pendants sourced from Egypt and Turkey, and the custom-designed red hanging lightboxes that include a pomegranate acrylic textured screen inside a dark metal frame. The bold colours and textures combine to add to the dining experience. No less than five archway styles are employed in the space, hearkening back to the old world and framing and separating specialty spaces within the environment. The striped wall is common to middle eastern courtyards, and the central water feature in a Damascus star shape was a critical element. The star is also repeated in a contemporary way on the custom tabletops. 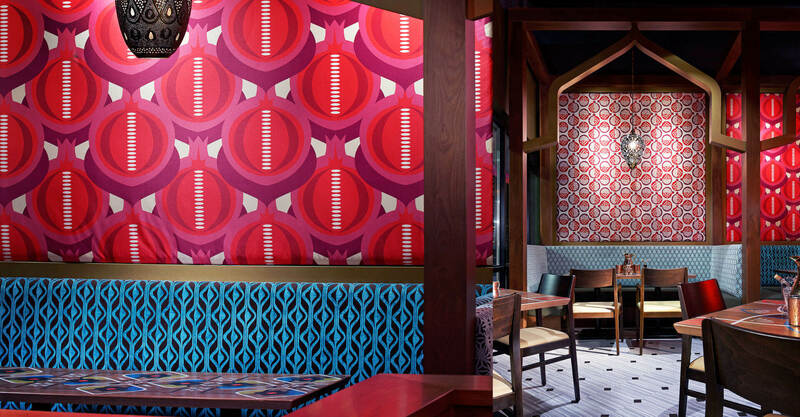 The wall coverings were custom-designed by our graphics team, as a way to pay tribute to the pomegranate. It is printed on fabric in order to give the walls a more textured feel. 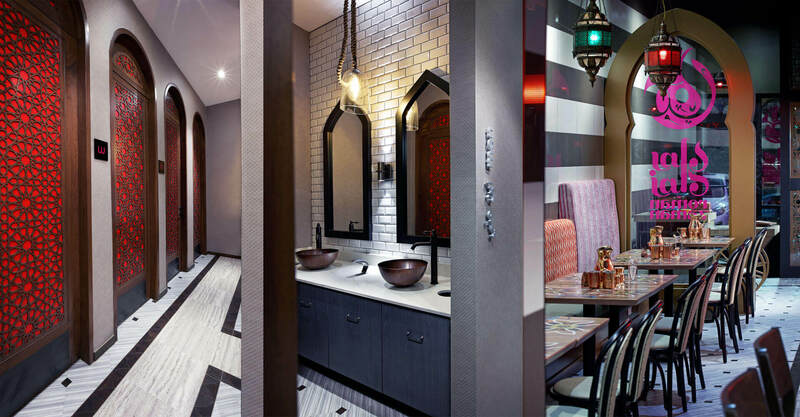 The details that complete the guest experience are wonderfully authentic, from the luxurious custom crockery, utensils, and copper service vessel, to the prayer room, bilingual way finding signage and custom mirrors and doors in the bathrooms. The guest experience is also enhanced with modern amenities such as USB charging stations in each of the booths. The Roman Zaman project was initiated in early 2015, and opened in October of the same year. You can find them online at www.romanzaman.com.